A. Schoenhut Co., Philadelphia, PA. Illustrations of Schoenhut’s Marvelous Toys, circa 1908, clown figures. Have you been to the circus lately? Well, here comes the Humpty Dumpty Circus—made up of toy figurines that children in the early 1900s could play with to create their own small circus. The circus figures are shown in this circa 1908 trade catalog by A. Schoenhut Co. titled Illustrations of Schoenhut’s Marvelous Toys. 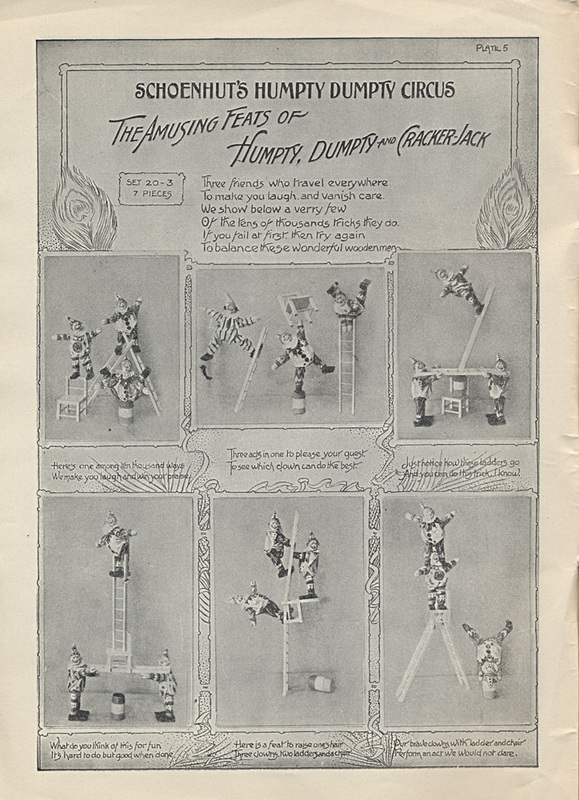 According to the catalog’s front cover, the toy circus figures can do “10001 Astonishing Tricks.” Inside the catalog, page after page shows the positions that the Humpty Dumpty Circus figures can be placed in and balanced. A clown balancing on top of two ladders, a clown dancing with a horse, and a clown standing on his head while balancing a ladder on his feet are just some of the many unusual tricks that the Humpty Dumpty Circus figures are able to do. The clowns are named Humpty, Dumpty, and Cracker-Jack. There are also circus animals—an elephant, horse, zebra, giraffe, and others. To complete the circus are accessories for the figures to use in performing their tricks—a table, chair, ball, hoop, barrel, ladders, and more. The clown figurines are about seven inches tall while the animals and accessories are of a proportional height or size. The toy figures are made of wood, jointed with heavy rubber cord, and painted in enamel colors.